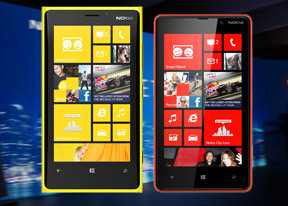 The second device introduced by Nokia is the smaller brother of the new Lumia flagship, the Lumia 820. It features a 4.3" AMOLED display of WVGA resolution and, while the resolution is lower, the AMOLED part is actually a step up from the 920. Sadly the Lumia 820 misses on the PureMotion HD+ fun. Inside, there's the same 1.5 GHz dual-core Krait and 1 GB of RAM, but a smaller 1650 mAh battery, and 8 GB of storage. Another advantage of the more affordable Nokia Lumia 820 over the Lumia 920 is the presence of a micro SD card slot, which supports cards up to 32 GB in size. As the Windows Phone 8 interface isn't finalized yet, we can't go much in depth from that standpoint, but we will give you our impressions of the hardware. The overall construction of the device does not feature a curved front glass display like the 920, but has a glossy paintjob which looks like it will attract fingerprints with regular use. The WVGA resolution makes the display really pale in comparison with the 920, but seeing as how they have the same internals, we expect the 820 to be zippier due to the lower amount of pixels it has to push. The construction shows the same meticulous attention to detail characteristic of Nokia, and the device feels very solid in-hand.